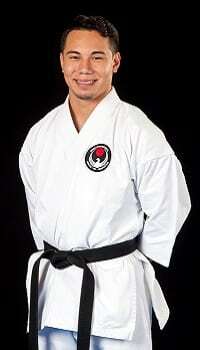 Nidan Colunga began his training on June 25th, 2007 at the age of 9 at the Academy of Classical Karate. He started training in the Kids Program under Sensei Garcia and Chief Instructor Sensei Brody Burns. He later joined the competition team (WIKF TEXAS) in January of 2008, where he quickly fell in love with the sport of Karate. Nidan Colunga obtained his black belt on December 12th, 2015 under WIKF Chief Instructor Sensei Jon Wicks. Through the years of training he has had the opportunity to be taught by Sensei Tatsuo Suzuki & Sensei Jon Wicks, both being the most Senior Instructors of Wado Kokusai Karate-Do Renmei. Through his competitive career, Nidan Colunga has had the opportunity to visit many countries for major tournaments all over the world since becoming a member of the United States National Karate Team. Nidan Colunga attended school in PISD and graduated in 2016 from Plano East Senior High School. While in high school he was on the Plano East Varsity Wrestling Team and a member of the JROTC Panther Battalion. As a member of the Panther Battalion he was a Squad Leader his Freshman year and was awarded the rank and leadership position of First Sergeant his Sophomore year, his Junior year he was a Platoon Leader, and his Senior Year he was given the leadership role of being Alpha Company Commander. Nidan Colunga is currently attending college studying to accomplish a Bachelor of Applied Arts and Science in Criminal Justice and hopes to one day be a Police Officer and future Federal Agent of the DEA or ATF. As a member of the United States National Karate Team, Nidan Colunga has had the opportunity to participate in major tournaments all over the World. He participated in the North American Championships, Pan-American Championships, and World Championships. At the age of 10, Nidan Colunga won his first national championship, at the age of 14 he made the USA Junior National Team and maintained his spot on the team for the next 4 years, and at the age of 18 he made the USA Senior Olympic National Team which he is still a part of. Through Karate, Nidan Colunga has traveled to England, Spain, Czech Republic, Austria, United Arab Emirates, Canada, Mexico, Peru, and Brazil. Nidan Colunga continues to compete and is training to hopefully participate in the 2020 Tokyo Olympics.